ATTRACTIVE RUSTIC PLANTERS – Unique hand crafted ceramic planters add a touch of old world charm sure to compliment any décor. They’re just the right size for any windowsill 4” high x 4.25” wide, especially your kitchen window. Plus, they’re a great value. They’re so attractive you can use them to grow other plants after your herbs are overgrown or start more herbs. SLATE MARKERS– Real slate markers with soapstone so you can write the names of your herbs on the markers. 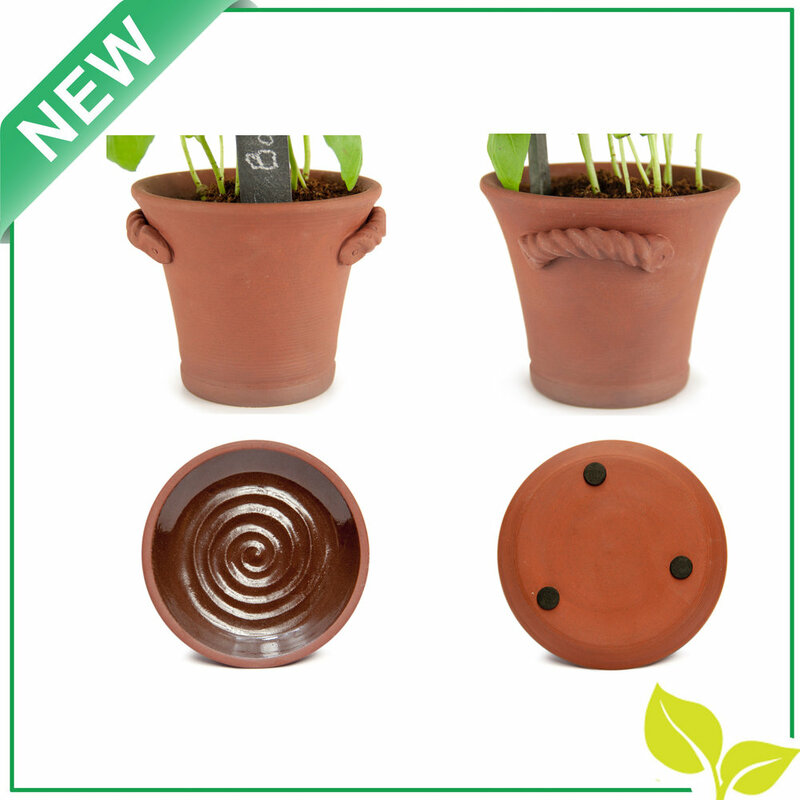 It’s an authentic touch that looks beautiful in the ceramic Rustic Charm Pots! FIBER SOIL – Plants thrive and live longer. The unique natural fibers provide abundant oxygen which reduces root rot from over watering, the number one reason for plant failure using traditional potting soil. GERMINATION BAGS – Seeds need moisture and warm temperatures to grow. 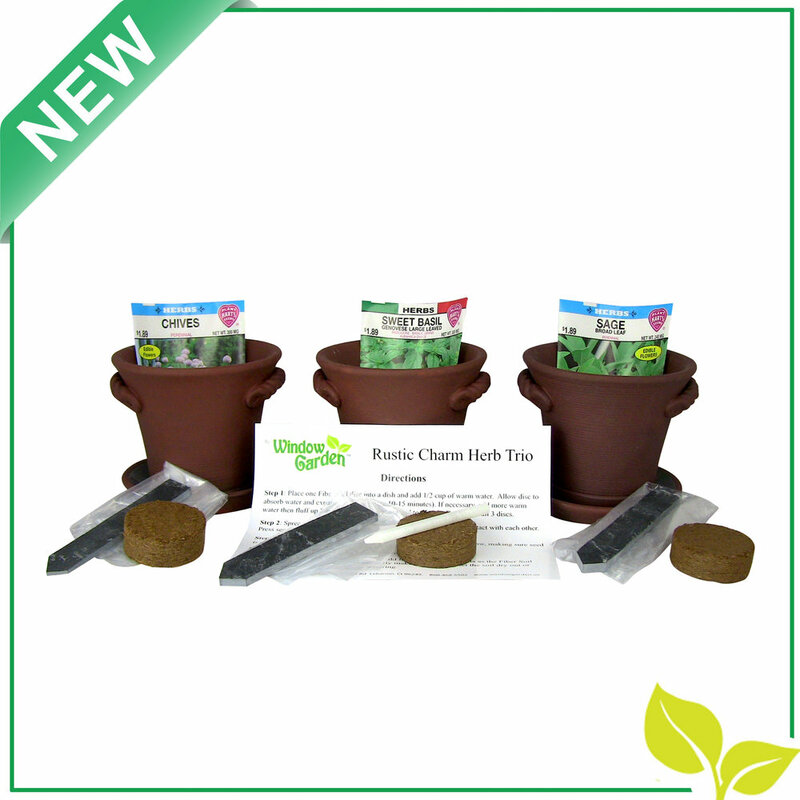 Place the germination bag over the pots for the ideal germination environment. Remove bag once they start to grow. And, you can feel good that the seeds are 100% Non GMO. 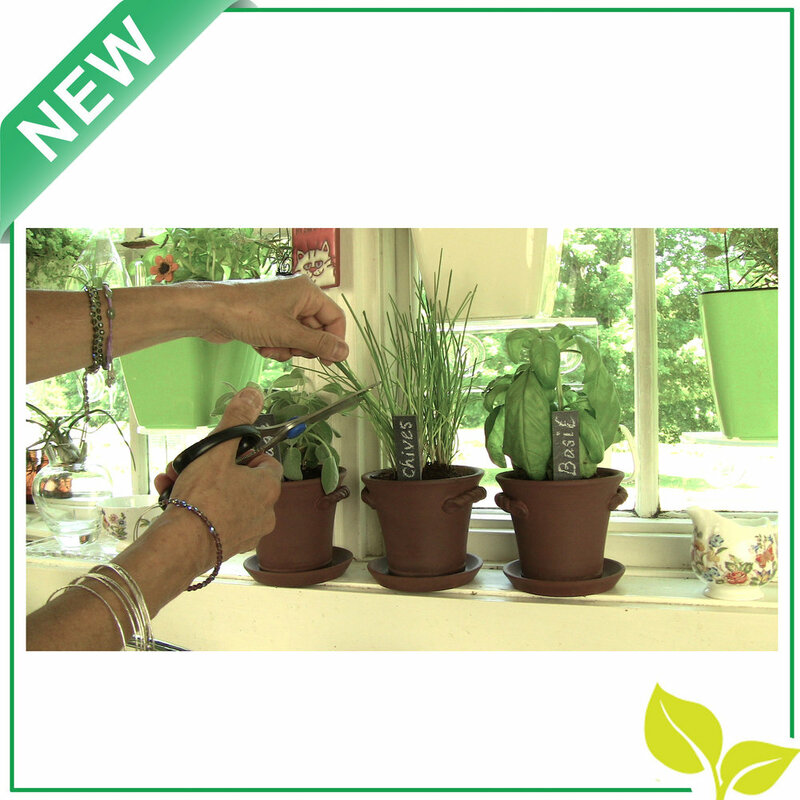 GREAT GIFT – Who wouldn’t want to grow an indoor kitchen window garden? From the impressive packaging to the quality components, this complete kit is sure to impress anyone who receives it! When preparing food, there’s nothing better then having fresh herbs at your fingertips. Don’t grow your herbs in some flimsy cheap pot. If you’re going to spend the time and effort growing them, use a kit that not only looks beautiful but also has the components to ensure success. 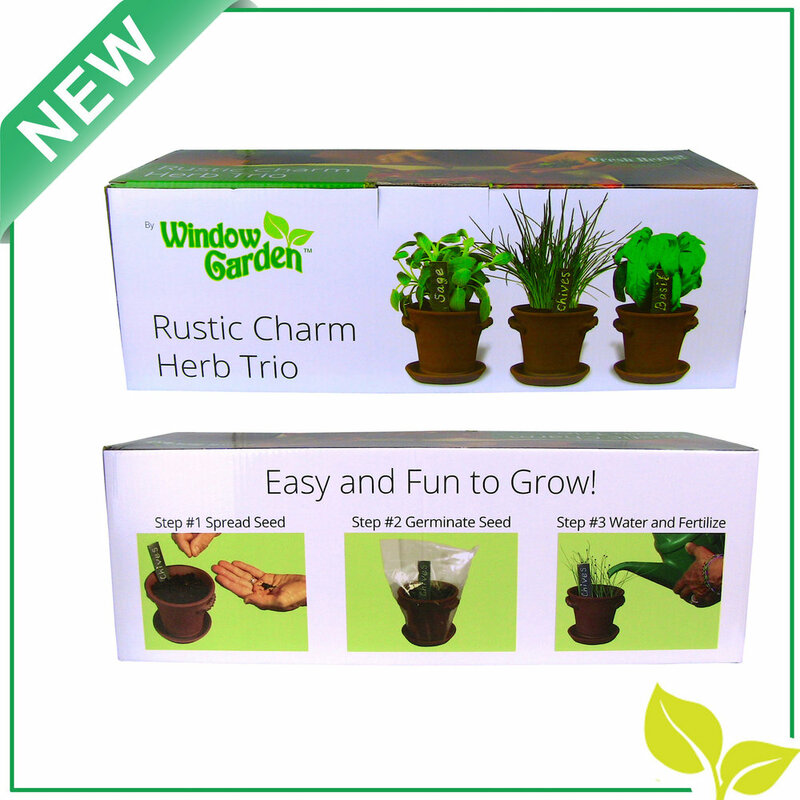 Now you can successfully grow your own herbs in style with the Rustic Charm Herb Trio Kit! 3) Over watering the plant after the seed germinates. We’ve taken steps to help you succeed. 1) We’ve included a germination bag that will keep seed moist and warm. 2) We’ve also provided a unique fiber potting soil that has an incredible ability to prevent overwatering. Most potting soils get overly wet and soggy, depleting its oxygen reserve, which causes plant failure. Our Fiber Soil holds its structure, allowing ample oxygen to get to plant roots, causing plants to grow and flourish. Note: Fiber Soil has minimal nutrients. It is recommended to add fertilizer after seeds have germinated. Plus, we’ve enclosed detailed instructions to help you through the growing process. We understand sometimes things don’t work out even with your best efforts… no worries. Just drop us an email and we’ll send you more seed to try again if it doesn’t work out the first time. Your satisfaction is our main concern.